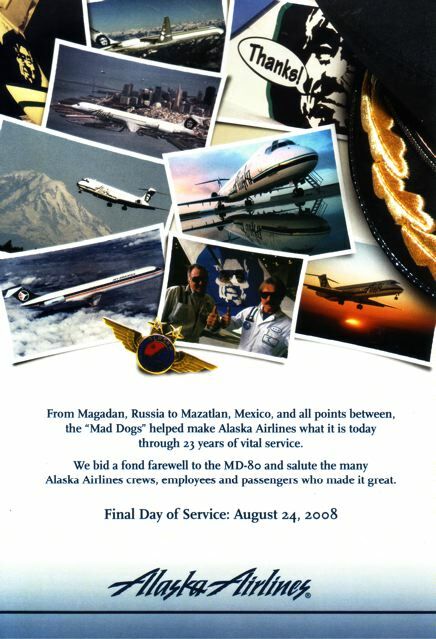 From Magadan, Russia, to Mazatlan Mexico, and all points between, the "Mad Dogs" helped make Alaska Airlines what it is today during their 23 years of service. 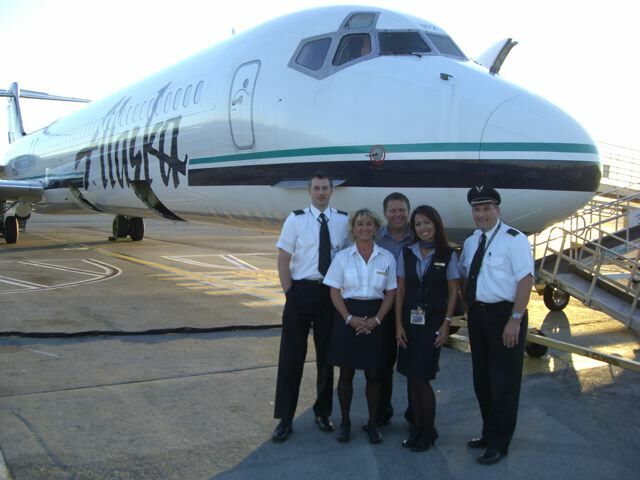 As we bid farewell to the MD-80, we salute our Alaska Airlines crews and the customers who flew with us along the way. 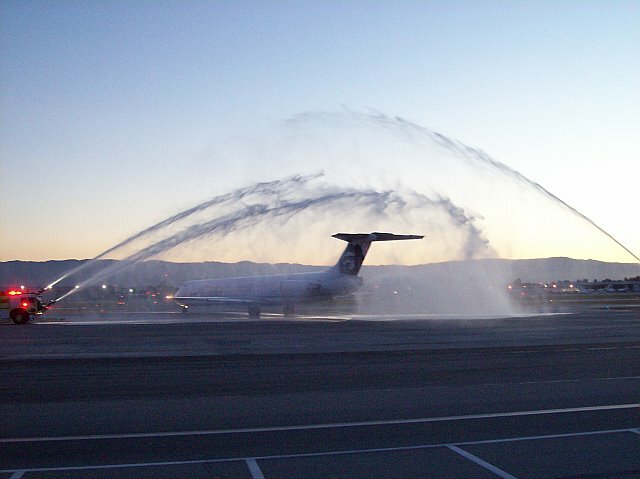 Our last two MD-80 flights take place on August 24, 2008. 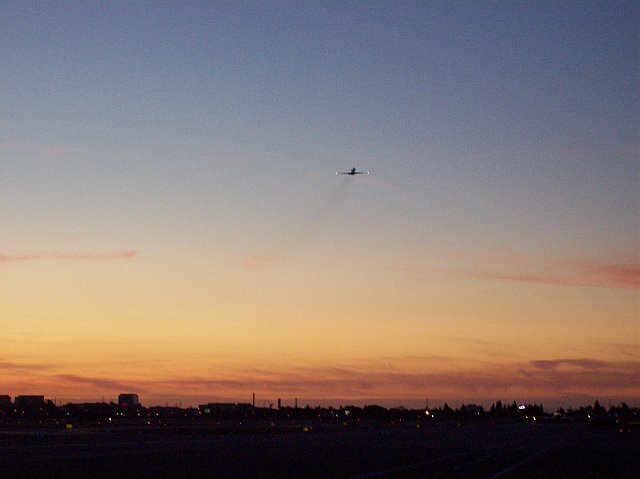 Flight 331 will depart San Jose at 7:50 p.m. and Flight 363 will depart Sacramento at 8:20 p.m. There are still seats available if you'd like to join us for this historic moment as we transition to an all Boeing 737 fleet! Book Now. 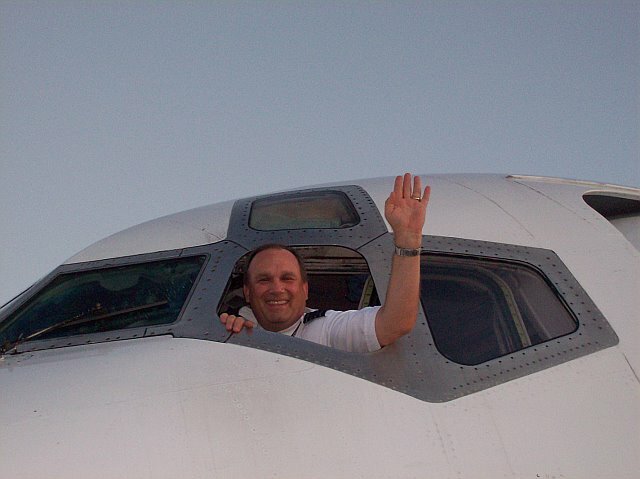 As luck would have it, my friend Jeff Johnston, is an MD80 Captain with Alaska, and would fly that day. The following is his description and photos of the eventful day. 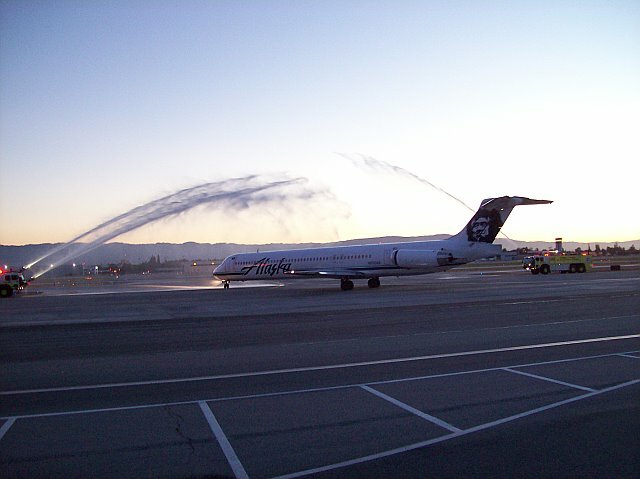 "This last Sunday (the 24th of August), the MD80 was officially retired at Alaska Airlines. I may have told many of you that it was my intent to ride the MD80 to the bitter end (think Slim Pickens' character riding the H-bomb down in the final scene of Dr. Strangelove), figuratively speaking, of course. Well, we missed being THE very last revenue MD80 flight by 10 minutes, which made us the second-to-last MD80 flight at Alaska. In the words of Maxwell Smart, "Missed it by that much!" Our flight, Alaska 331 (aircraft N972AS), SJC-SEA 24AUG2008 blocked in to Gate C18 in Seattle at 9:52pm. Flight 363 SMF-SEA blocked in to Gate C12 at 10:01pm. The kicker...it wasn't even supposed to be my flight. As a Reserve Pilot at Alaska (meaning I fly when someone calls in sick or a trip needs covered for someone on vacation), it was purely a fluke and luck-of-the-reserve-draw. On the evening of the 23rd, I received a call from scheduling who proffered me Pairing 8045 (SEA-SJC-SEA). The reason: Captain Dave "Too Tall" Mendenhall had been removed from the trip due to a 30 in 7 problem (a flight-time regulation preventing him from flying more than 30 hours in a 7 day period). I'm not sure how many captains had already turned down the trip by the time they called me. For some reason I had the 25th in my head as the last day of MD80 scheduled flights (Scheduling wasn't sure either) and I almost turned down the trip myself. After a brief moment, I decided to take the trip, though, because I thought I might not get another opportunity to fly the MD80 before it rode off into the proverbial sunset. It was not until reporting to Gate D3 in Seattle at the beginning of the trip that I learned our two flights were part of the official "Last Flight Ceremonies". Losing the distinction of being THE last MD80 flight into Seattle was offset, somewhat, by our being THE last MD80 departure out of San Jose, CA (SJC). In addition to the SJC agents and ground personnel making us feel like rock stars, the airport fire department gave us the dual firetruck water arches normally reserved for retiring pilots. Why is this man smiling? No 737 training until December 1st. Taxiing to Runway 30-Right via taxiway Zulu-Foxtrot-Alpha. Making the right turn onto taxiway Foxtrot while barely getting my window closed in time. "Can we get the Premium Wash and Wax?" 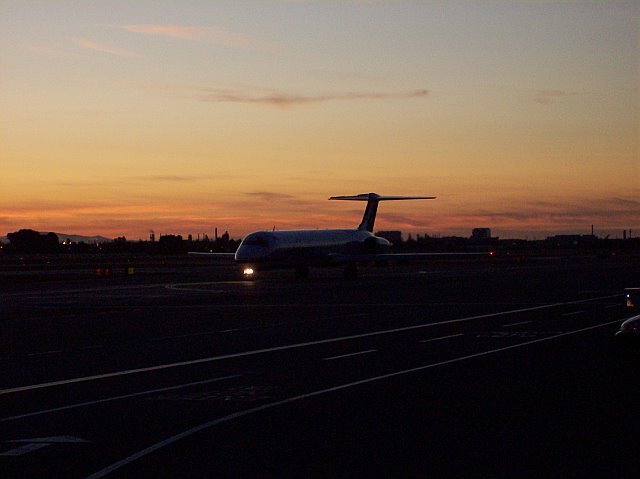 The last MD80 climbs out from SJC into the proverbial sunset. Abeam Sacramento climbing through Flight Level 300 (30,000 feet) on our way to FL340, we called Sacramento Operations on the company frequency to check on the status of Flight 363. Captain Bob Carlson chimed in and told us they were just about to push back from the gate, which meant they would in fact be behind us (I'm betting they waited until they found out we were airborne). He and First Officer GC Harris ended up being 80 miles behind us the entire way to Seattle and blocked in only 9 minutes behind us. Our crew after our arrival in Seattle. A commemorative certificate handed out to our passengers. "There is still the chance that a few of the MD80's could be used as equipment substitutions (if a 737 or 737 crew is unavailable) through the end of the month, but Sunday was the last of the scheduled flights. The remaining airplanes will be ferried to the boneyard in VCV (Victorville, CA) - most of them going this week - where they will be put in long-term storage. After September 1st, the MD80 base in SEA is officially closed and I'm a man without an airplane until trained on the 737. I will be officially assigned to the 737 in SEA as a captain on September 1st, but don't start training until December 1st due to classroom capacity issues in having to retrain all the MD80 pilots. 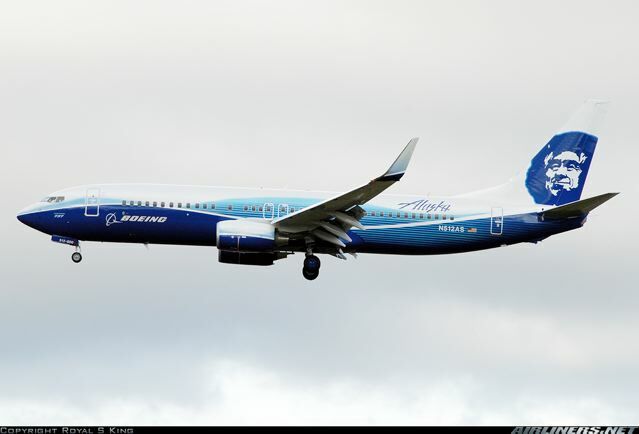 At the MD80 Farewell Party on Thursday August 28th, Alaska will also unveil our newest Boeing 737-800 called "The Spirit of Seattle" sporting a new paint job (I guess it's not really too much of a surprise as the photo below was downloaded off of airliners.net). The paint job commemorates our transition to a true, all-Boeing fleet (either that, or we've just been bought by Boeing - just kidding)." The 737-800 that replaced the last of the MD80s - named the Spirit of Seattle, and painted in Boeing Company colors. Unveiling the "Spirit of Seattle"
MD-80 retired from the fleet and the airline welcomed a new 737-800. The aircraft was adorned with the striking blue-striped livery of The Boeing Company along each side of the plane and, of course, the carrier's proud Eskimo on the tail. 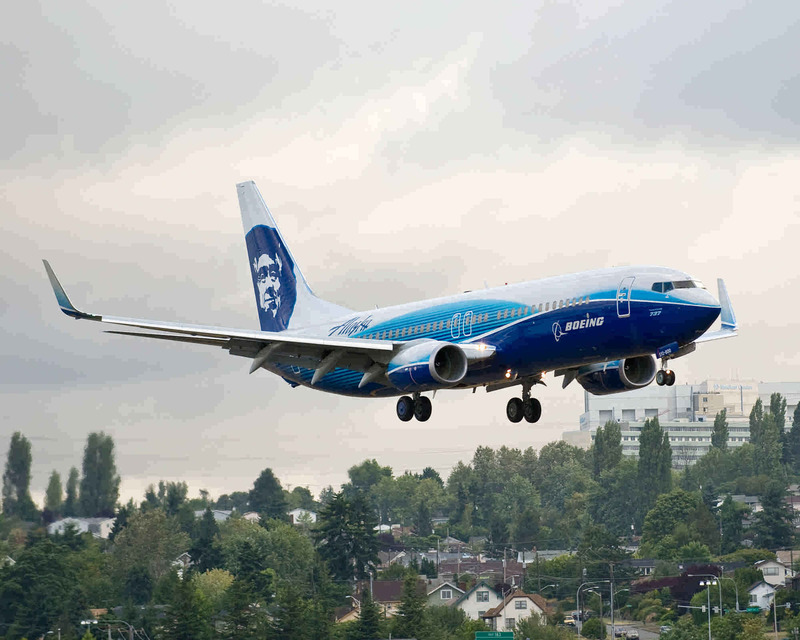 Named the "Spirit of Seattle," the aircraft symbolizes the valued, longtime business relationship between Alaska Airlines and Boeing. With this transition, Alaska Airlines now operates one of the youngest, most technologically advanced fleets in the industry. The benefits of this newer fleet include better reliability, increased passenger comfort, and significant improvements in fuel consumption and emissions. SEATTLE — Alaska Airlines today completed its transition to an all-Boeing 737 aircraft fleet with the retirement of its last MD-80 series airplane, part of a two-year plan to increase the airline's operational efficiency and improve fuel conservation. "With the last of our MD-80s retiring today and scheduled deliveries of additional new Boeing 737-800s this year, Alaska Airlines now operates one of the youngest, most fuel-efficient and technologically advanced fleets in the industry," said Bill Ayer, Alaska's chairman and chief executive officer. "Our all-Boeing fleet will make a major difference in customer comfort, fleet reliability and operating costs, at a time when it matters most." The 737-800 burns 850 gallons of fuel per hour, versus 1,100 gallons per hour by the MD-80. A common fleet type also will result in lower costs for maintenance, training and flight crew scheduling. As the airline's last MD-80 circled Washington state's Mount Rainer in a symbolic final flight, it was joined in the sky by a newly delivered and specially painted Alaska Airlines Boeing 737-800 airplane, dubbed the "Spirit of Seattle" in tribute to the airline's now all-Boeing fleet and unique hometown partnership with the airplane manufacturer. "Your newest Next-Generation 737, with its commemorative livery, is symbolic of our great working together relationship," said Mark Jenkins, Boeing 737 vice president and general manager. "Boeing is committed to Alaska Airlines' success, and we're proud to be your hometown partner." The 737s are equipped with the most advanced safety and navigation systems. Chief among them is Required Navigation Performance precision approach technology and Head-up Guidance System, which allows takeoffs and landings in low-visibility conditions. Alaska's 737s also are equipped with Enhanced Ground Proximity Warning System, which alerts pilots of ground obstacles. The airline has firm commitments for an additional eight Boeing 737-800s through 2008, which will bring its fleet to 116 Boeing 737 aircraft. That compares to 26 MD-80s and 110 total aircraft at the onset of the airline's fleet transition in 2006. Alaska Airlines acquired its first MD-80 aircraft, manufactured by Long Beach-based McDonnell-Douglas Aircraft, in 1985, and once operated 44 of the jets. The MD-80, with its larger fuel tanks for extended range, was the cornerstone of the airline's expansion up and down the West Coast, as well as into Mexico and the Russian Far East during the 1980s and ‘90s.